The HP MSA 2052 SAN delivers a flexible and simple solution to All Flash and Enterprise storage systems ideal for small to midsize businesses, and at a low cost to acquire. Whether it be remote office deployments, snapshot or archive repositories or virtualization, the MSA 2052 SAN model reduces bottlenecks and provides businesses with advanced management features not typically found in entry level storage such as thin provisioning, snapshots (up to 512), volume copy, space reclamation and more built into every device! Plus, with scalability to add up to 7 expansion units, the MSA 2052 makes it easier than ever to upgrade your storage capacity. HPE MSA 2052 SAN devices are easy to maintain, install, or use and deliver twice the IOPS performance of the previous generation, making them the best SAN for small businesses! 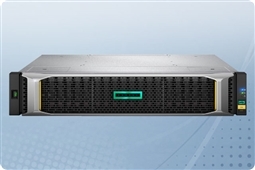 Each Aventis Systems custom HPE MSA 2052 storage array comes with a standard 3 years warranty with upgrades to NBD and Extended warranty terms available. Have product questions? Please use our Live Chat for a quick response, call us at 1.855.AVENTIS (283.6847) or email us at Sales@AventisSystems.com. Check out the products below today and bring the best storage features for the best prices to your business today with the HP StorageWorks MSA 2052 from Aventis Systems! HP MSA 2052 SAN LFF Storage, 12 x SAS or SAS SSD 3.5"
HP MSA 2052 SAN LFF Storage, 6 x SAS or SAS SSD 3.5"
HP MSA 2052 SAN SFF Storage, 24 x SAS or SAS SSD 2.5"
HP MSA 2052 SAN SFF Storage, 12 x SAS or SAS SSD 2.5"